Before burning the candle, what do I need to do to represent myself and the female target? Do I use pictures of me and her or can i carve our names on the figures? Also do i need a petition paper? Carve your names on the backs of the figures with a needle. Dress them with oil. If you have a picture of the two of you together -- or can make one by combining two phoitos with an editing tool like Photoshop -- put a dab of honey one each face and fold the picture in half so the faces "kiss." Place this photo under whatever fireproof stand you use to set the candle on. would a petition paper help or not necessary? msg33 wrote: would a petition paper help or not necessary? Incorporating a petition is up to you, if it helps you focus better on the work at hand or if you would feel incomplete without one, then by all means write one up. 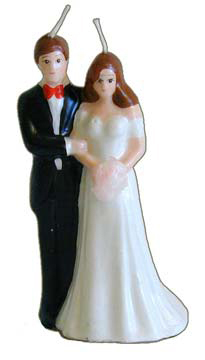 Can someone from LM pls tell me the standard burn time of the bride & groom figural candles on the site. They are used for 7 day rituals and are around 3 inches or so. I need this to evaluate my spell and to know how much time i would need to meditate for everyday. It will help me realize if it burnt sooner than expected or at a normal rate. The way I meditate & visuaize usually takes one hour and i hardly even realize the time. But these candles since small may burn out in a day itself if i do that. The store didn't tell you the burn time? I don't know for sure because I haven't had to use this candle in my experience so far, It for sure doesn't last 24 hours, i'm sure it'll last an hour for your visualization though, maybe a few more after that. You'll be fine. Nothing to loose, its still lit and the intent is still there. path2success wrote: Can someone from LM pls tell me the standard burn time of the bride & groom figural candles on the site. They are used for 7 day rituals and are around 3 inches or so. I'm not sure where you linked the bride and groom figural candles with 7-day rituals--unless you were planning on burning one bride and groom candle per day for 7 days (7 candles in all). Burn times on the 3" bride and groom candles can vary widely--20-30 minutes is average, but they can burn (significantly) faster or slower (and the bride or the groom may burn faster or slower than the other), and this can be a form of divination regarding the prospects for the relationship. 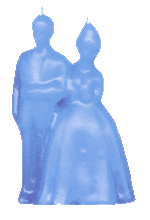 The bride and groom candles have a u-shaped wick, one end at the head of each figure. Both ends (both heads of the couple) are lit at once, and are usually not extinguished once the burn has started. If you are planning on meditating for an hour while this candle is burning, you may indeed have a puddle of wax by the time you finish. That's because I think in the Love Me Spell kit, for example, the bride and groom candle is to be burnt over 7 days. I also have the same question about figural candles like the Lover and the Skull etc. - whether one should burn it in one go, though another fellow forum member said 7 or 9 days is more powerful. cabriellenil wrote: That's because I think in the Love Me Spell kit, for example, the bride and groom candle is to be burnt over 7 days. I also have the same question about figural candles like the Lover and the Skull etc. - whether one should burn it in one go, though another fellow forum member said 7 or 9 days is more powerful. I burn skulls and figure candles over a seven to nine day period. The Lover and Skull figural candles are significantly larger than the Bride&Groom candle (andeach have a single wick to the Bride&Groom candle's 2). I would say that, like Mary, many workers burn the Lover and Skull candles over multiple days (7-9 being probably the most common). That said, if one were to burn the Bride&Groom candle over 7 days, one would have to burn it for no more than 5-10 minutes per day. can an image/figural candle be used in a break up spell? i have a black couple candle..would that be sufficient? Yes you can use a black couple candle. Or you can use two figure candles one for him, and one for her. You start them back to back, and then move them away from each other for 9 days, and burn them for about 10 mins. On the 9th day, let them burn out. as i have the black couple candle.. i would use that for that spell.. but what would i need to anoint the candle with? and what other procedure would i need to do? Anoint the candle with Break Up oil. With the couple candle specifically, when the figures are burnt mostly down, I take a good size knife or cleaver and hack them apart. I also use the idea about spliting the couple candle apart. I usually do that full of anger. It really helps Or I get a hammer, and act like Im just hitting the couple and think about breaking them apart. As for oils, break up oil, destruction oil, separation oil, and inflammatory confusion oils are good. I have a friend that likes this guy that she works with. They flirt constantly (his jokes aren't funny and she laughs incredibly too hard) and apparently eat their lunches together, so it's obvious that they like each other, but they are both shy about making the first move. Could I use the pink marriage candle to give them a push? Also which LM oil should I use to anoint the candle with. 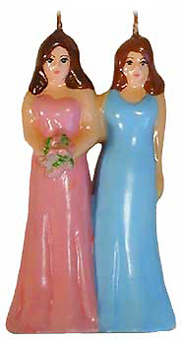 You can use the pink marriage candle, but you can also use the Lover's candle or two candles, one Adam and one Eve. There are a number of delish LMC love oils that would be appropriate and I suggest blending a few for added oomph. Thanks Bri I just received the marriage candle and I'm going to use Come to me and Attraction oil. I had bought some not to long ago. I have a black figural couple candle.. I wanted to use it on my ex and his current gf... but the issue is that I no longer think he is with her any more. However, I have found out that another girl is interested in him. What can I do to make sure this new girl doesn't get her way with him. Also how do I make sure that the previous gf is completely out of the picture once and for all!! Also can I still use the figural candle for my ex and any general person that he may have interest in? Why not get a reading to be sure of the situation before starting any spell work? I agree with thelightfantastic. You should get a reading done because there is not way we can tell you if she is out of the picture or not. If you are trying to keep him away from other girls, then you can do a binding spell or even freezer jar to stop him from being interesting in dating anyone. But I would get a reading done first before you go any further. Thank you ELKnapp ! I somehow missed your response. Now everything seems right. I got the bride and groom candle in the break up kit and it said I have to burn it for 7 days. I couldn't get it to burn for more than 5-8 mins per day exacty as you said.Now I'm at peace knowing the spell is fine. Can i use destruction oil on a black couple candle? What exactly is your intention with that? Do you want to curse the relationship? Or do you want to break them up? Because you may be better served by using seperate candles. Destruction oil does what its name indicates-bring about destruction. Its part of the crossing family of oils. If you are looking to cross a couple's relationship you can use the black bride and groom. If you are looking to break them up then look into the Break Up line of products as well as a divorce candle or black bride and groom candle. Destruction oil is great for break up work and anything you want to destroy in a negative way. So yes...you can use it on a black couple candle, and I have used this oil in addition to the break up oil/powder and it has worked. In addition, I have used destruction oil, along with herbs and curio such as goofer dust, , graveyard dirt, red pepper, asafoetida, etc. It is helpful to break up a relationship if that is what you are going for. ok i prayed over & prepaired a bride & groom candle. i put oils, deers tounge leave & powder. under the candle was a photo of my target with my petition written on it which i also applied some oil to. When i went back i guess beacuse the photo was a paper photo it caught fire & started to burn. Now there is absolutly NOTHING LEFT! NO WAX, NO PHOTO, NO WICS, just the ashes of what burned! & what do i do with them just blow them into the wind???? GOOD or BAD please help????????????????????????????????? Sounds like you had a nice clean burn and don't have much to worry about. A piece of advice though... People are more likely to respond to a thread titled "Help with candle spell and disposal" rather than something with allcaps, netspeak, and too many punctuation marks. Just saying. i forgot to ask...once i hack the couple candle apart, how would i dispose of the pueces? crossroads?? graveyard?? addtionally, as the firgural couple candle will be in two seperate bits would i dispose him as well as her and if so do i dispose them in seperate areas of say a graveyard?? sorry for all the question's just want to make sure i understand the concepts. For break up work, I like to dispose of them far apart from each other. So I will dispose of one at one crossroads, and the other at another far from that one. Or the person I want my target to break up with will go in the graveyard and down the river, and the other person in a crossroads. That is just a personal preference, but the crossroads and graveyard are two good ones. If you are fortunate, you can bury the remains on the couple's property or on each of their properties. Doing this method has actually yielded me more effective results. Several different typs of figural candles have been traditionally used in break-up work. The black couple candle (like a bride-and-groom candle, with the pair side by side, and made of black wax) is a powerful image, and completing the work by chopping the candle in half with a cleaver is a long-tstanding tradition. 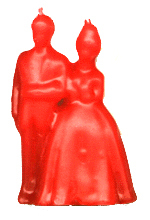 The divorce candle (a mal and female figure back to back, with a small tapr candle attached between) is used in a similar way, and can also bun out between the two figural portions or be hackd apart. A pair of Adam and Eve candles, or a pair of clothed Lady and Gentleman figures can be "walked apart from one another during the ritual, and thus separated. thank you so much for the insight Cat and Stars! greatly appreciated!! has anyone done this before? i really want to as i want the guy hotfooted but not the girl. i was thinking of putting it on the guy part but not all of it. so that way there as it melts it does not get mixed with the girl half. is that wise to do or not/? as i dont want to risk hotfooting both targets. Are you doing a break up candle? If you are not, then just get a black candle, figural or not, then put the hot foot on that. if not you can put it on the male part of the candle. Your intentions are to hot foot the guy so you would not hot foot the girl if it "accidently" mixed. Yep it is a break up candle Stars. i just wanted to be sure id not mess this up in any way. i will be adding hotfoot to the guys part of the candle then..that and some lovely inflammatory confusion oil on the whole candle as well. is 15 mins about the time to burn this candle nightly? i will be starting this in a few minutes here. all your help is always appreciated Stars. it depends how fast the candle starts burning. The candle may start burning really fast within the 15 minutes to the point you will not have enough to burn for the entire length of time you want to burn it. If that happens then you need to change the amount of time you are burning it. ah thats true..i may just use pins to separate the burnings in sections then. ive never burned a candle such as this figure before. i wonder what the burn time is averaged for if it was burned as one time from start to finish. There are two bride and groom candles listed, painted, but no pictures. I dont know what the colors are or how they are painted, so I dont really know which to choose for what purpose. The bride and bride candles are assorted colours in various "easter egg" tones -- pink, yellow, sky blue -- with varied hair colours. 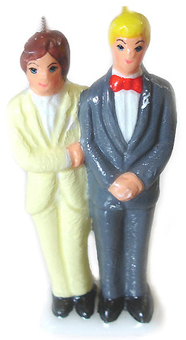 The groom and groom candles are in assorted grey, black, white, cream-yellow, and dark blue suits, with varied hair colours. I've always wondered about these candles, thanks for the pictures cat! And to kittynmoon for bringing it up. I burned a pink bride and groom candle on a honey jar for reconciliation. The groom side burned slower and the wax melted away from the bride and then looped back around. Is this a negative sign? I would say that indicates the man will come around to the idea of reconciliation more slowly than the woman. He may actually even try to run away from the process, but should be able to be brought back around to the idea of the relationship with skillful management of the situation. The pink bride and groom couple can be used both for attracting romance and for reconciliation. The red bride and groom is for passion, especially within a committed relationship or marriage. The major difference in these two ways of working would be your choice of oils when dressing the candle. For enhancing romance, try Kiss Me Now Oil, Bewitching Oil, Love Me Oil, or a blend of them, and for restoration of a romance, use Return to Me Oil or Reconciliation Oil or a mixture of the two. I received my Reconciliation Spell kit in the mail today only to find the neck on the bride of my bride and groom candle is broken. Poor thing. Her head is still attached because the wick runs through her whole body, but she is most definitely broken. Would burning this broken candle have any kind of effect on the spell work involved? The bride is supposed to represent me and I would rather not break my own neck or anything. As I have not received an answer to my question I finally called the shop. I thought I'd post the answer I received here for anybody else who may need to know. Personally I don't see that burning the candle will be harmful. I think that what I'll do is heat up a needle and use it to gently melt her neck back together. Putting her head back on her shoulders may actually be symbolic in situation. (a) it says on the day after the last spell, I should sprinkle some of the water at his doorstep. i am worried about him seeing me. is there an alternative to this? your help will be greatly appreciated. thank you! I have found that the timing on these spells and the means of disposal are essential. I understand what an inconvenience it is but, think of the payoffs. I don't know what to tell you about the disposal. I usually take one of my dogs out for a walk whenever I perform any type of disposals to remain inconspicuous. Otherwise, if you're concerned about him seeing you, why not bring something to him like a cake or pie? That way, you can just conveniently spill some on his doorstep. Sorry that there's not too many ways around this. The more you put into a spell, the better your chances are of success. I have a question about the bride and groom candle. The reconciliation spell I'm using says to carve the names of the two people involved on the side that matches your gender. What happens when you're both men? Is there a different candle I need to get for that? Yes, there is a different candle for this. Hey everyone, I started a bride and groom candle and the grooms candle burned quickly and was gone the 1st/7 nights. It's now the third night and the brides head didn't completely burn, and ended up falling off. What could that mean? Also, there is Melted wax from the groom on the bride as well as the brides wax on the groom. Most of the running wax is in the back of the candle. Unfortunately, we do not perform candle interpretations on the forum. Hey again. So this question isn't about divination really, but it's the 4th night out of 7. How ever the bride and groom candle has already gone out. There is no more wick to burn but there was a lot of melted wax. Since I intended this to last 7 days, should I start over or continue with another candle and work it till the 7th night. Or should i do nothing at all but dispose of the candle remains and burry them in my back yard? If this were me, I would light another bride/Groom candle. And yes, bury the wax remains of the one that you had already burned.